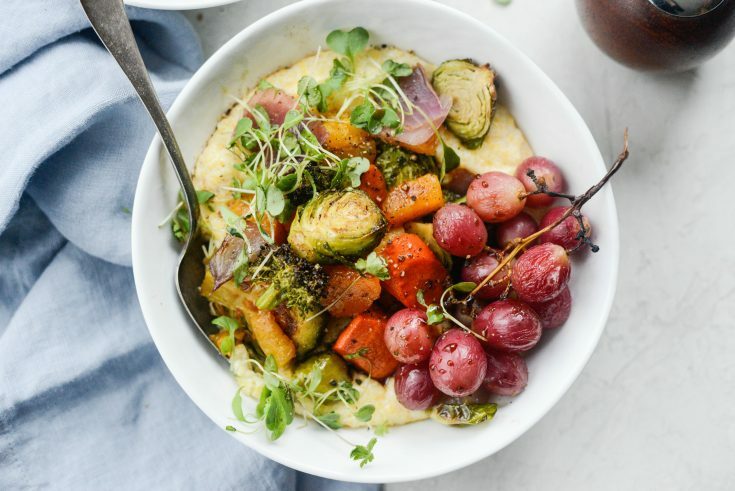 This Roasted Honey Balsamic Medley is served over creamy goat cheese polenta. 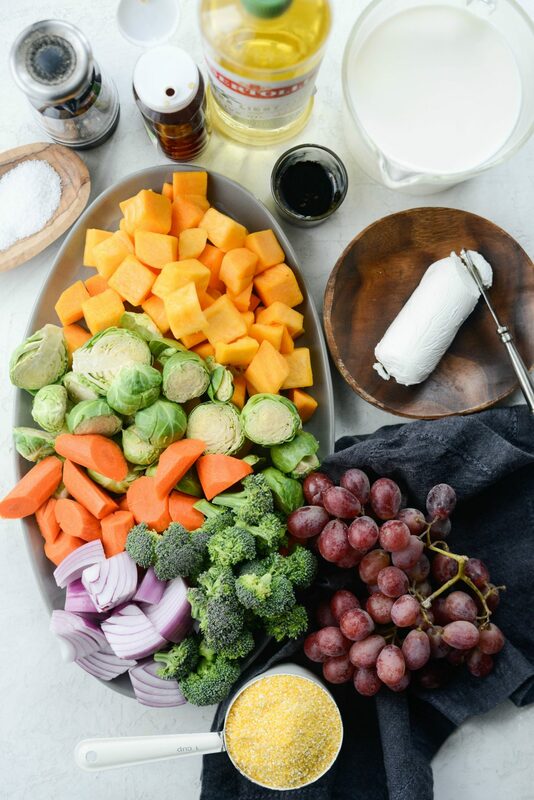 In the medley is butternut squash, Brussels sprouts, carrots, broccoli florets and purple grapes are roasted before being tossed in honey and balsamic vinegar. 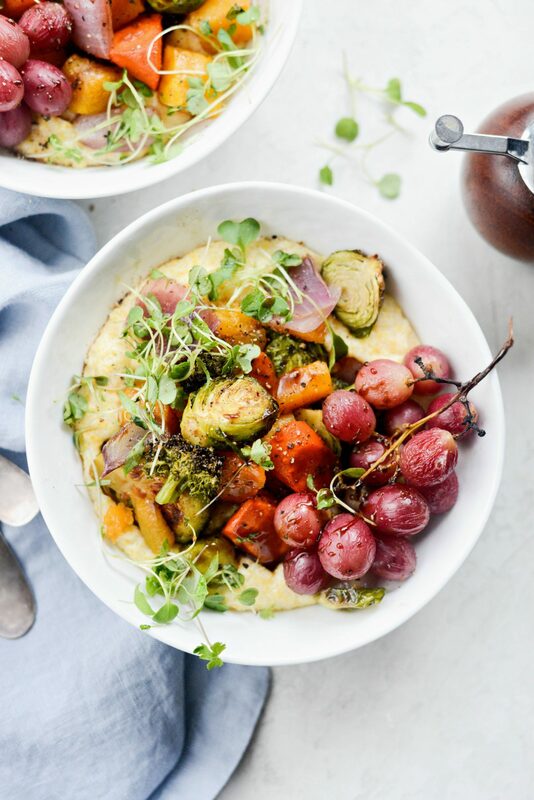 The perfect on top of creamy goat cheese polenta. 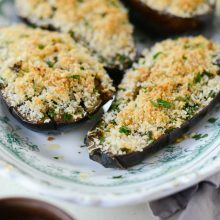 A super delicious meatless dish. It snowed an inch here on Friday which really is no big deal, but it did put me in the holiday spirit. Something about the big fat snowflakes falling got me in the mood to turn on the Christmas music while I worked, roasting a giant pan of vegetables. This recipe sort of came out of nowhere, a clean-out-the-fridge recipe that I had zero clue the final product would look like a gorgeous food rainbow in a bowl. So, where should I begin? Should I start with the roasted medley thats tossed with honey and balsamic vinegar? Or should I mention the goat cheese polenta is ridiculously creamy and delicious? Maybe I should state the fact that these things together are a match made in food heaven and therefore my newest favorite combo. Because that’s exactly what this is. Heaven. 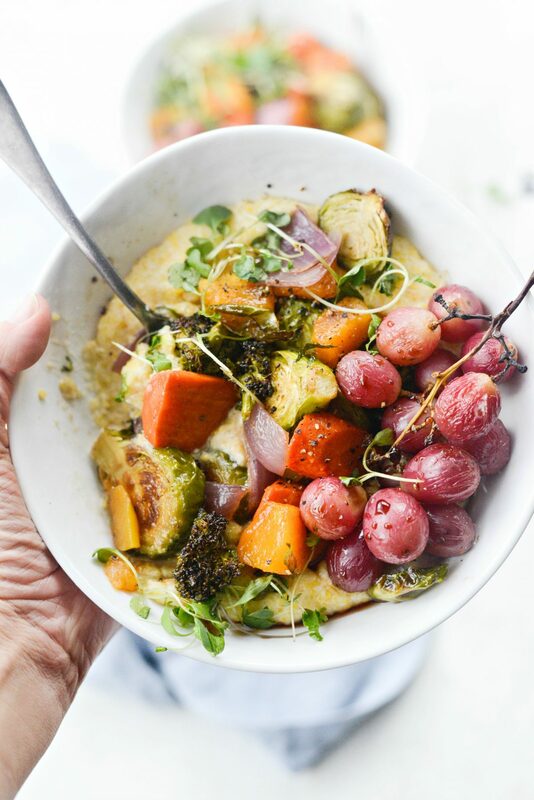 The tender vegetable medley and sweetness from the roasted grapes with the tangy, creamy polenta is my newest favorite combo. 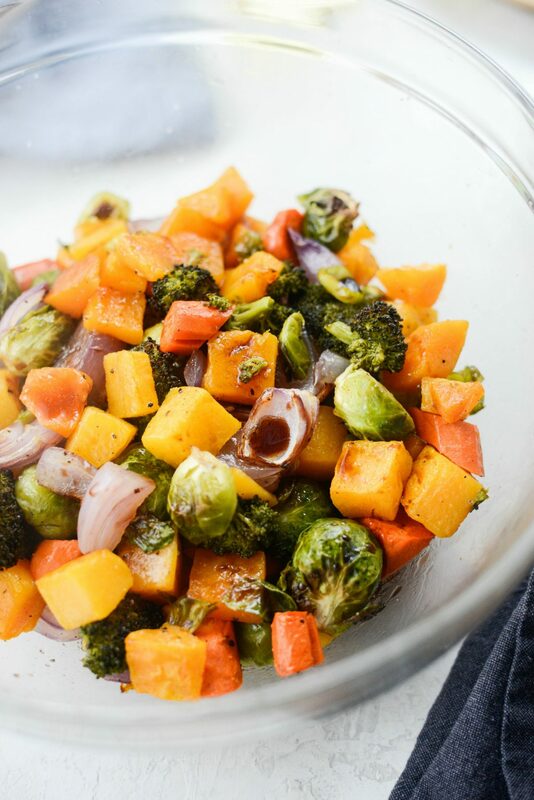 Here’s what you’ll need; 1 pound diced butternut squash, 10 ounces brussels sprouts, 2 large carrots, 1 medium red onion, 1 cup broccoli florets, 1 to 2 bunches red grapes, olive oil, salt and pepper, 2 tablespoons reduced balsamic vinegar (glaze) and 1 tablespoon honey. 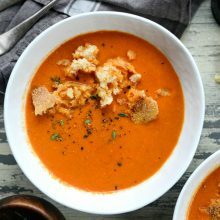 For the goat cheese polenta you will need; 2 cups whole milk, 1 cup low-sodium vegetable broth, 1 cup polenta, 3/4 teaspoon kosher salt and a 4 ounce log of goat cheese. 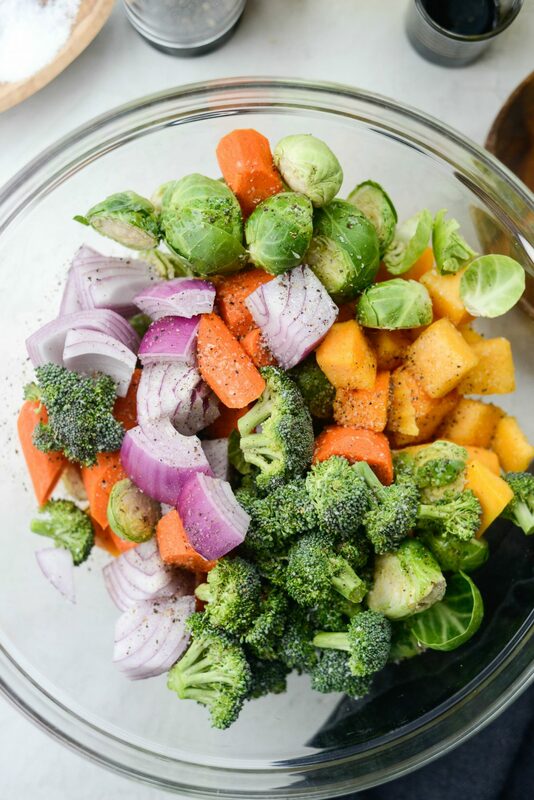 To start, in a large mixing bowl, combine vegetables with 2 tablespoons of olive oil and a few pinches of kosher salt and freshly ground black pepper. 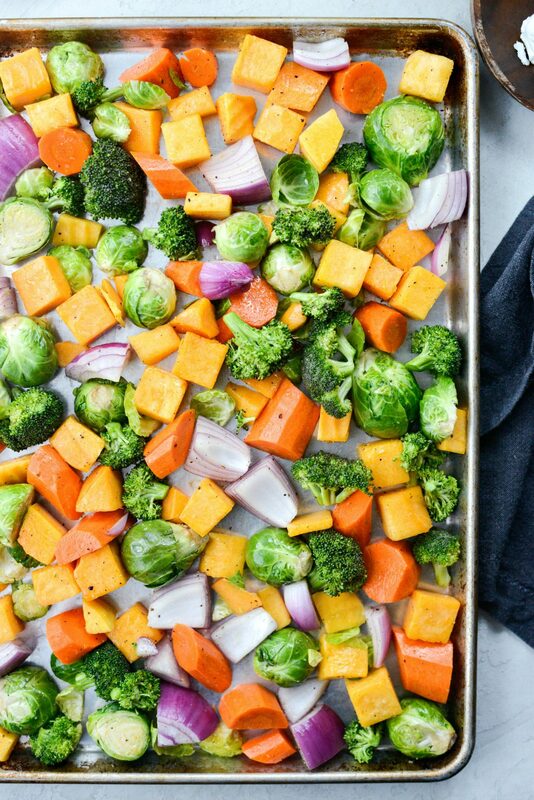 Spread the veggies out evenly onto a large, rimmed metal baking sheet and slide into your preheated 400° oven for 20 minutes. Rotate the pan halfway during roasting, because you want to ensure even cooking. Then, after the 2o minutes, remove the pan and increase the heat to 425°. 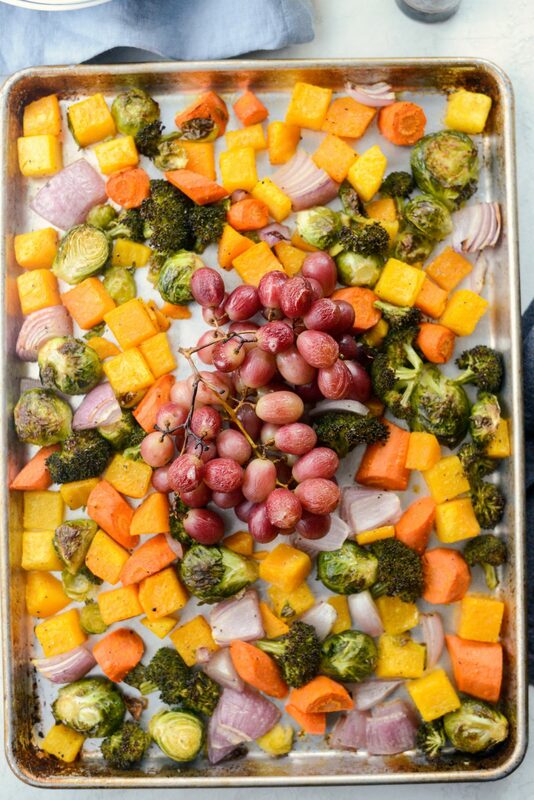 Spray the grapes with olive oil spray, make room on the sheet pan and continue roasting for 10 to 15 more minutes. 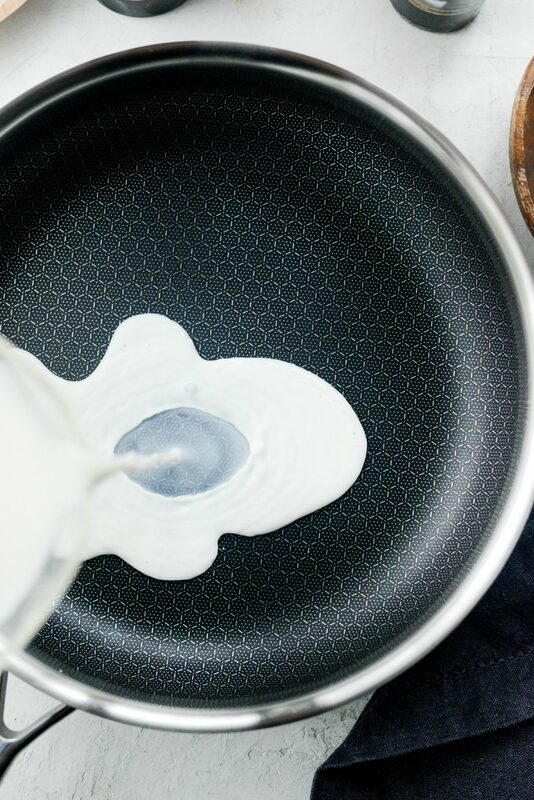 Meanwhile, in a deep-sided skillet, bring 2 cups of milk with 1 cup of broth to a boil, whisking often. Next, whisk in 1 cup polenta and 3/4 teaspoon kosher salt. 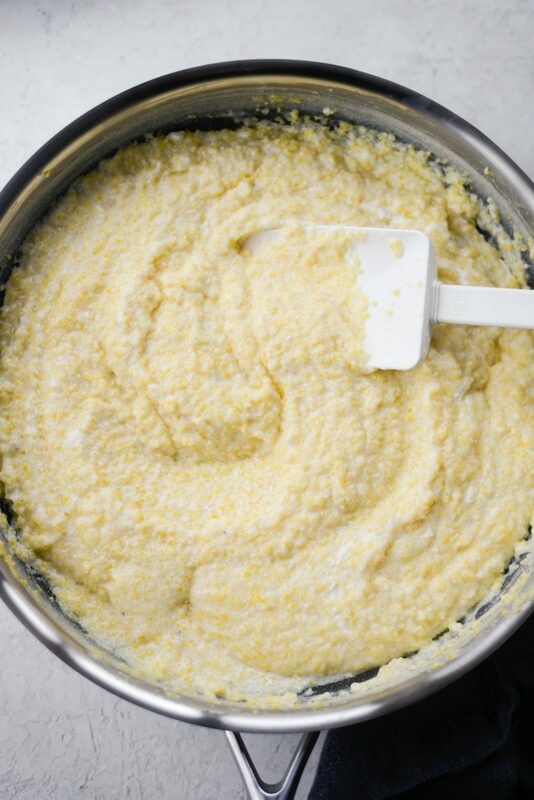 Continue to whisk constantly until the polenta starts to swell and absorb the liquids. 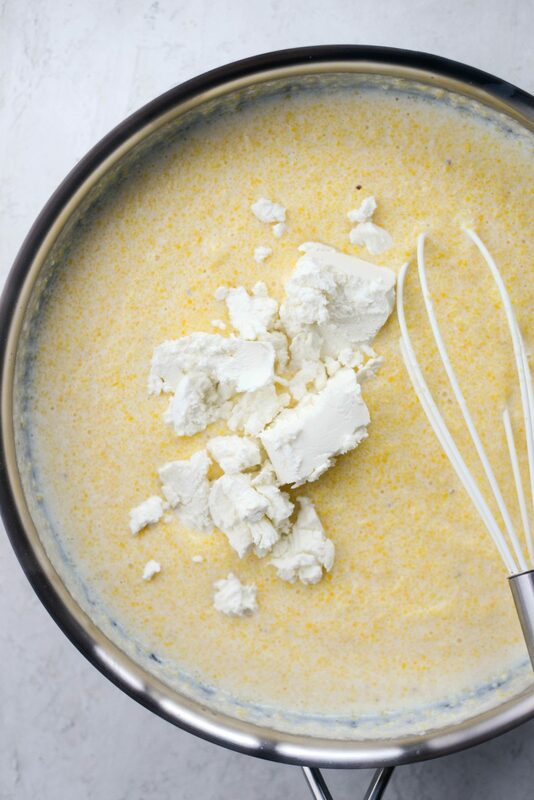 Continue whisking while adding in the goat cheese, stirring until creamy and smooth. Keep warm over low heat, stirring every so often. Next, remove the grapes from the pan and then add all the vegetables into the same bowl from earlier. Drizzle 2 tablespoon balsamic vinegar and 1 tablespoon honey over top, tossing to combine. Lastly, serve the roasted honey balsamic fall medley over goat cheese polenta. Finish this off with micro greens, more black pepper and balsamic glaze. Now you can finally take a bite and experience what is love at first bite. Enjoy! 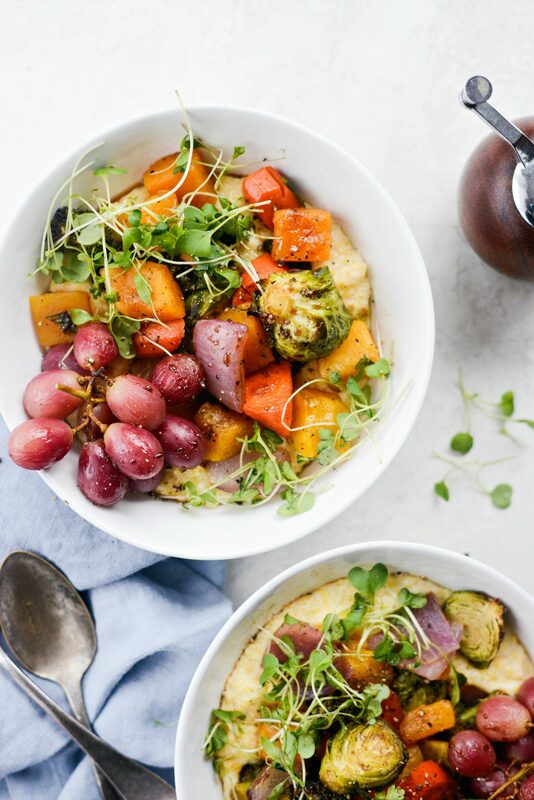 And if you give this Roasted Honey Balsamic Fall Medley over Goat Cheese Polenta recipe a try, let me know! Snap a photo and tag me on twitter or instagram! 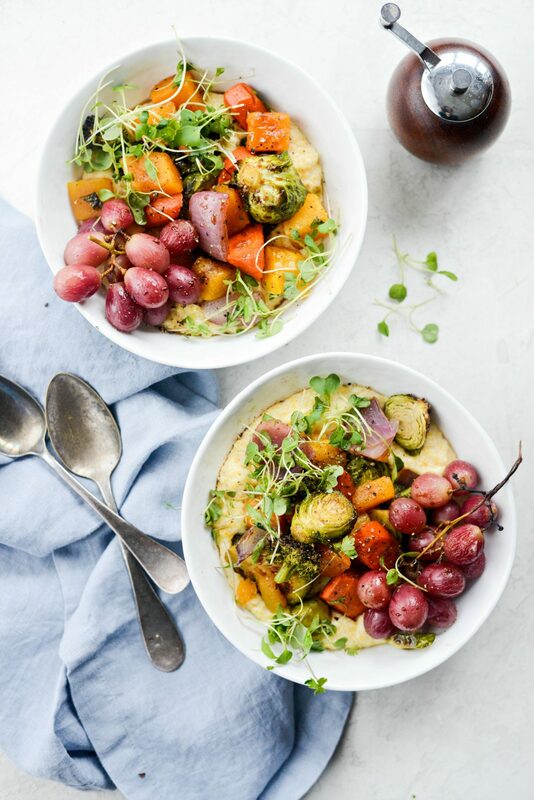 A roasted medley of butternut squash, Brussels sprouts, carrots, broccoli florets and purple grapes are tossed in honey and balsamic vinegar and sit on top of creamy goat cheese polenta. A super delicious meatless dish. 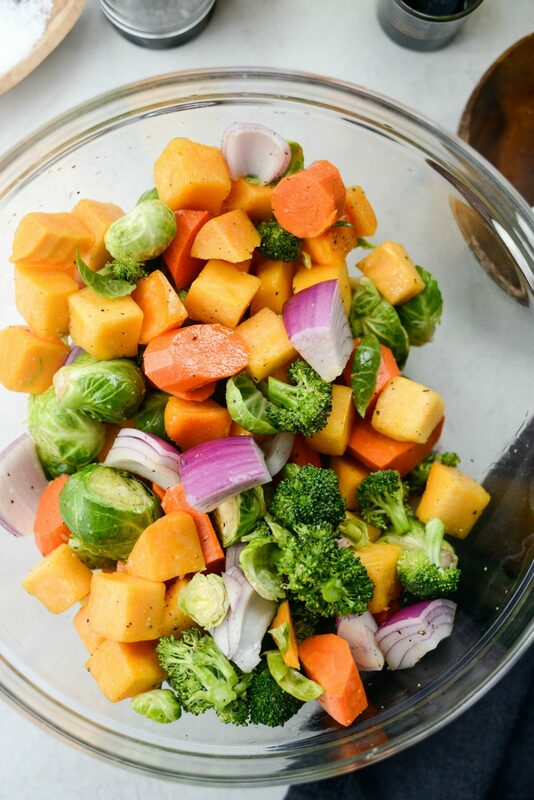 In a large bowl add the diced butternut squash, Brussels sprout halves, chopped carrots, onion and broccoli with 2 tablespoons olive oil and a couple pinches of kosher salt and black pepper. Roast on the middle rack for 20 minutes, rotating the pan halfway through. Meanwhile, spray grapes with olive oil spray. 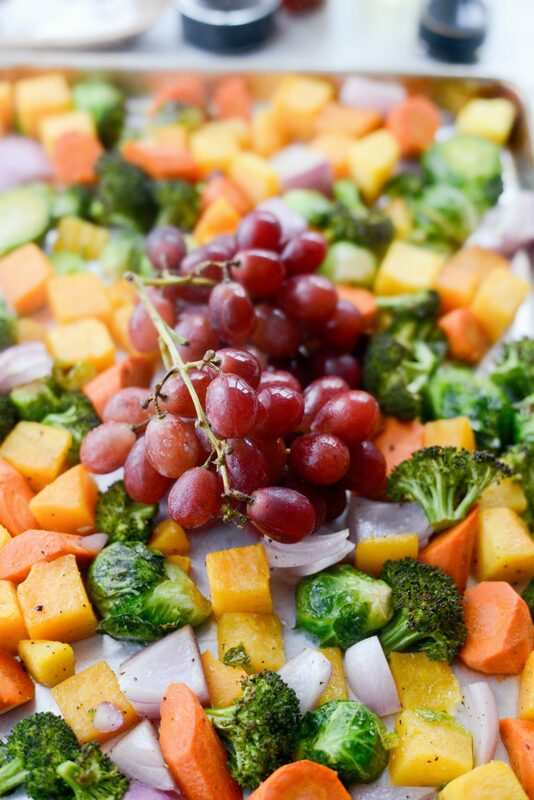 Once the vegetables have roasted, make room on the sheet pan for the grapes. Continue to roast for and additional 10 to 15 minutes or until the grapes start to burst. Remove the medley to the same bowl from earlier and toss with balsamic vinegar and honey. 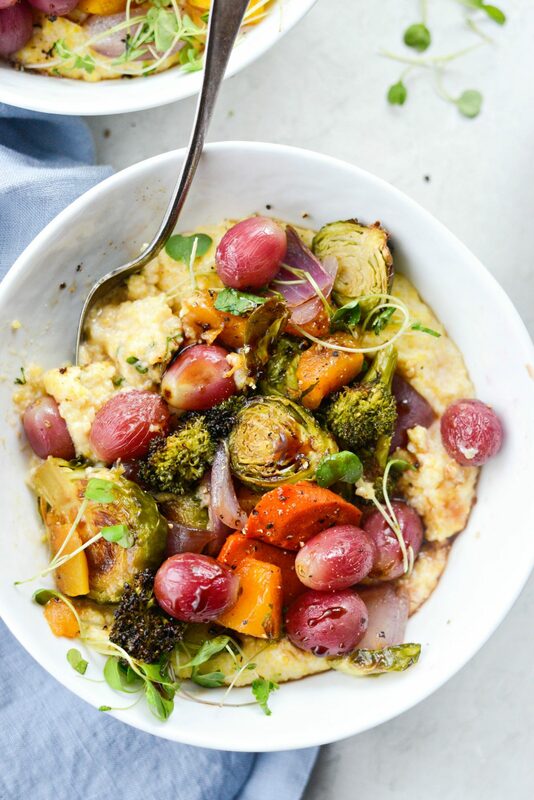 While the grapes are roasting with the vegetables, make the goat cheese polenta. 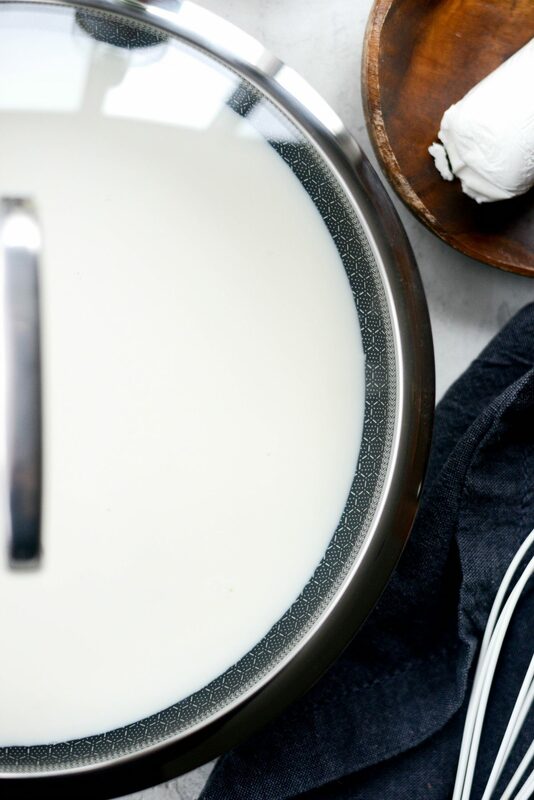 Start by heating 2 cups of whole milk with 1 cup low-sodium vegetable broth to a boil, stirring often. 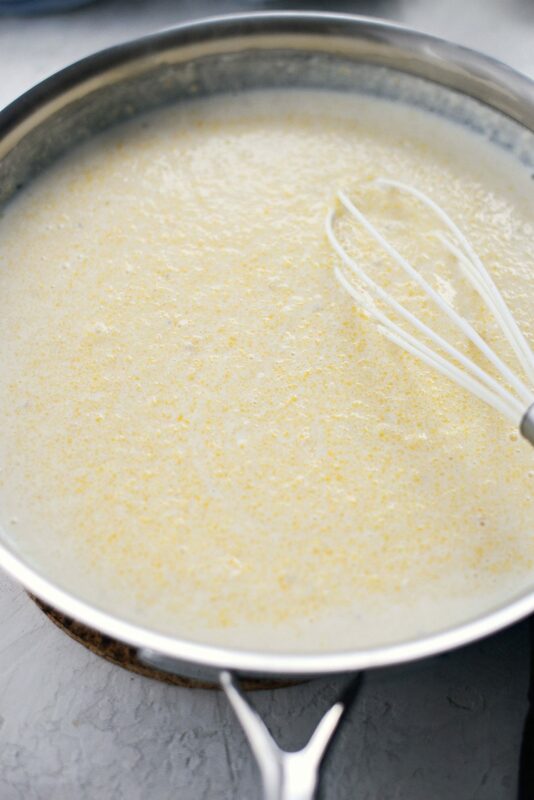 Continue to stir while pouring in the coarse grits and 3/4 teaspoon kosher salt. Once the grits start to swell and absorb the liquids, stir in the goat cheese. 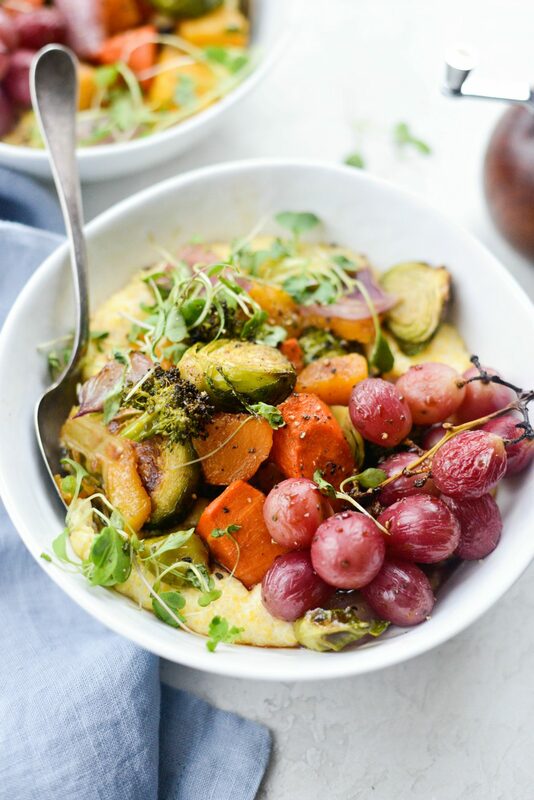 Once the grits have absorbed all of the liquids and are creamy, divide among bowls and top with the roasted medley, micro greens and more black pepper to taste. 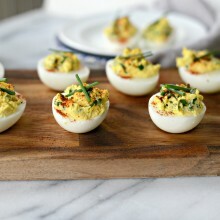 I’ve never been so happy that I failed at weekend shopping/meal planning so it’s not too late to make this this week! Looks so, so delicious!!! Yay! Procrastinating for the win!! Enjoy, Katelyn! This looks amazing! 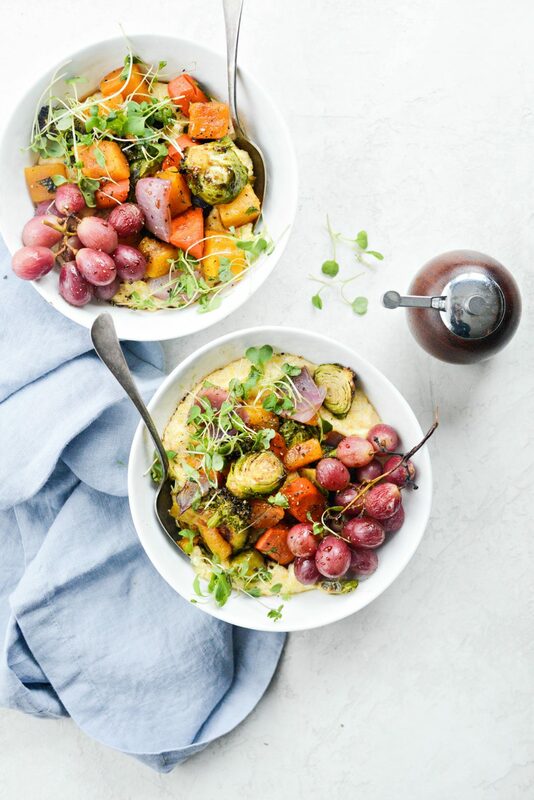 Waking up to a blanket of snow again today definitely makes me want to try this dish! Looks like another winner. Thank you! I agree with you, Sarah! It’s extra cozy with the snow!